Content Clusters recognise that the content you create, is in itself an opportunity for multiple content ‘events’ across your channels, extending the life cycle of your marketing beyond a single content execution. Take for example a client creating a single piece of video content (as seen in the diagram above). Naturally the release of the video is a content event, but there is a micro-system of other opportunities that can be explored for promotion and cross promotion around the video. Prior to the shooting, an announcement can be made on Twitter creating expectation of intended shoot and content. On the shoot day itself social post of On-set stills, Gif’s or video snippets can be shared as Teasers, building on the momentum of expectation. 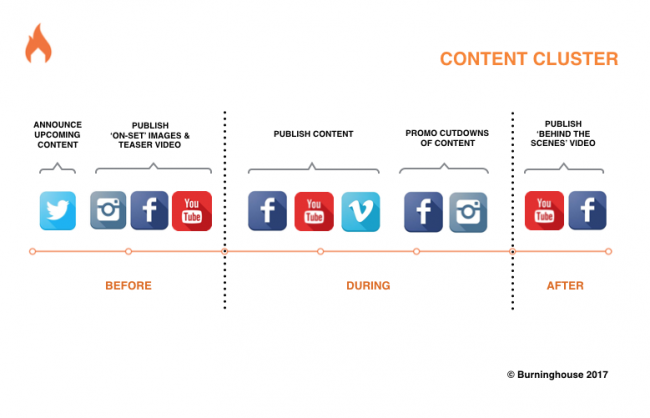 When the content is published, short promotional cut downs should be released across social platforms, essentially acting as advertising for the audience to view the longer content, extending the reach and promotion of video. Finally, in the period after the content has been released and consumed, a ‘Behind the Scenes’ video can further prolong the audience engagement. This Cluster approach is ultimately an amplification of your content efforts and should assist in bolstering your content calendar. To learn more about how you can leverage Content Clusters in your next campaign, contact us at Burninghouse.